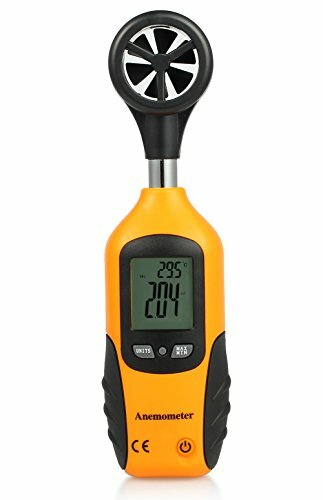 This multifunction anemometer provides instant data such as Air Speed and Temperature in Dual Level LCD display. This weather device is an ideal tool for windsurfing, sailing and kite flying. You can also use it for industrial and home purposes such as measuring speed and temperature of CPU computer fans, air-conditioners, airflow over the roof or walls. Circuit Description: Custom LSI microprocessor design. Display: Dual function 8888 count LCD display. Data Hold: Freezes reading on the display. Sensor Structure: Air velocity sensor, conventional twisted vane arm with low-friction ball-bearing. Memory Recall: Record and recall MAX/MIN readings. Auto Power Off: After 15 minutes with disable feature. Operating Temperature: 32℉ to 122℉ (0℃ to 50℃). Power Supply: 9V Battery (Included).